I have been invited as a featured author to the Southern Kentucky Book Fest in Bowling Green April 26 and 27, 2019. I had a great time talking about Liberian Military History with my fellow panelists Jacien Carr, George Kieh, Rebecca Nielsen, and Chris Wyatt during the annual Liberian Studies Association conference at Concordia University in Chicago. Learn more about the life of legendary military trailblazer Charles Young through the new exhibit, "Yours for Race and Country: Reflections on the Life of Colonel Charles Young," which opened March 16, 2019 and runs through August 2019. The National Afro-American Museum and Cultural Center collaborated with internationally renowned quilt artist and curator Dr. Carolyn Mazloomi for this exhibit that mixes art, story quilts, and Young artifacts from the NAAMCC collections. I wrote the 32 vignettes on episodes in the life of Charles Young and Dr. Mazloomi sent them out to her artists networks who created amazing works of art. The Omaha Corral of the Westerners invited me to speak about my latest book during their monthly dinner on March 7, 2019. I spoke about my latest book, African American Officers in Liberia: A Pestiferous Rotation, 1910-1942 at the Kentucky Center for African American Heritage on Sunday, February 24, 2019. I talked about my latest book, African American Officers in Liberia: A Pestiferous Rotation, 1910-1942 to 100 soldiers and civilians at the U.S. Army Recruiting and Retention College on February 8, 2019. I did a book talk at the Filson Historical Society on February 7, 2019. Great crowd in spite of the driving rain! I was thrilled to see a recently released poster by the West Point History Department that features Charles Young with John J. Pershing, Carl Spaatz, and Fox Conner. Here is a link to a podcast from Sunday, January 20, 2019 I did with Alex Hastie who does the Ohio V. The World Podcast. This is Episode 8: Ohio vs. Discrimination, Colonel Charles Young. This is a review of my book African American Officers in Liberia: A Pestiferous Rotation, 1910-1942 by Tom Ricks in the New York Times on November 9, 2018. Scroll down to the third book on the list. Dr. Chuck Wash, Director of the National Afro-American Museum and Cultural Center and I did a podcast discussing Charles Young with Alex Hastie on October 27, 2018. The podcast will air in January 2019. I was in Wilberforce, Ohio at the National Afro-American Museum and Cultural Center on Saturday October 27, 2018 for a book talk and signing. I was thrilled to have Keith Rountree in the audience, whose great Uncle William Rountree, served in Liberia. I talk about William Rountree's outstanding leadership and sacrifice in the book. William Rountree also served in the Ninth Cavalry under Charles Young in the Regular Army. I visited Wilberforce, Ohio for two events on Friday, October 26, 2018. First stop was a visit to Wilberforce University to talk to Dr. Kizito Mary Nakizito's English 265 African American Literature II class about Charles Young's experiences at West Point from 1884 to 1889. 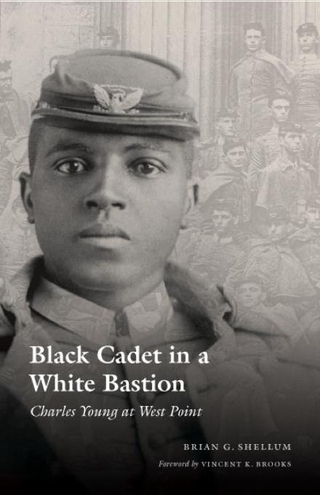 The class was reading my book "Black Cadet in a White Bastion: Charles Young at West Point" as part of their course work. The second stop was at the Charles Young Buffalo Soldier National Monument to talk to interns and get an update on future planning at the site. I talked about my latest book with the Old Washington Wordsmiths, a group of writers from the Maysville, Kentucky area, at 5:30 PM at the Ohio River Valley Arts Guild at the Old Washington Guild Hall on September 18, 2018. I did a book talk and signing at the John P. Parker House in Ripley, Ohio, on September 8, 2018. Ripley is the special town in Ohio where Charles Young grew up. I was invited to do a talk and book signing at the Maysville Public Library on September 8, 2018. Always great to visit the Kentucky county where Charles Young was born. I did a book signing at the Skagway Book Depot in Skagway, Alaska, on August 7, 2018. Great visit! I was invited to talk to a large crowd at the Klondike Gold Rush National Historical Park about the Buffalo Soldiers in Skagway, Alaska, on August 7, 2018. Company L, Twenty-Fourth Infantry was posted in Skagway from 1899 to 1902. My book "African American Officers in Liberia: A Pestiferous Rotation, 1910-1942" was published in August 2018. I will begin a series of visits and lectures for book signings. You will find a list here and on my Facebook site as the schedule is set. I attended the Society for Military History annual meeting, held in Louisville, Kentucky, April 5-8, 2018, and presented a panel paper on African Americans in Liberia, 1910-1942. I spoke at the National Afro-American Museum and Cultural Center at Wilberforce, Ohio about the legacy of Charles Young on Saturday, February 24, 2018. This was part of the museum's Historically Speaking Lecture Series. On Friday, February 23, 2018, I met with Dr. Carolyn Mazloomi, the founder and director of the Women of Color Quilters Network (WCQN). I am working with Dr. Mazloomi on an exciting Charles Young quilt project that will go on tour next year. I wrote thirty vignettes representing highlights of Young's life which she turned over to her WCQN artists to create quilts to tell his story. I saw a similar exhibit last year on the life of Nelson Mandela of South Africa. It is a fascinating way to tell Young's story to reach an audience that might not learn about him in another media. The exhibit is tentatively scheduled for a showing at the National Afro-American Museum and Cultural Center in Wilberforce, Ohio in February 2019. 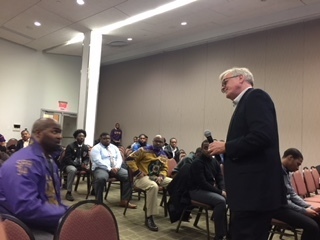 I was invited by the Psi Iota Chapter of the Omega Psi Phi Fraternity to speak about the legacy of Charles Young at Delaware State University on February 6, 2018. A great audience listened to my 30 minute talk and spend 45 minutes asking amazing questions. I talked to a packed crowd at a Black History Month luncheon at Dover Air Force Base on February 6, 2018 about the legacy of Charles Young mentoring a generation of African American officers for service in World War I and other U.S. conflicts. I spoke to a group of adults and children at the annual celebration at the Colonel Charles Young Park in Louisville, Kentucky on September 23, 2017. The Colonel Charles Young Park is on the West End of Louisville on the site of the former Colonel Charles Young School for African Americans that closed in the 1950s. I presented a paper titled 'Buffalo Solders in Africa: African American Officers in Liberia, 1910-1942" at the Society for Military History Conference in Jacksonville, Florida on April 1, 2017. Other members of the War and Society in West Africa panel included Roy Doron, Tim Stapelton, Jacqueline Woodfolk, and Bruce Vandervort. I worked with Dr. Carolyn Mazloomi on an exciting Charles Young quilt project. Dr. Mazloomi is the director of the Women of Color Quilters Network (WCQN) and thirty of her artists are creating quilts that tell the story of Charles Young. My job was to write thirty short stories accompanied by photos that convey the important events or aspects of Young’s life. The artists then create the quilts. It will bring the story of Charles Young to a new audience in an exciting new media. I saw a display by the WCQN last summer that portrayed the life of Nelson Mandela of South Africa. The show was at the National Afro-American Museum and Cultural Center in Wilberforce, Ohio, where the Charles Young quilts will appear in 2018. Can't wait to see the results! The Kentucky Educational TV (KET) Kentucky Life segment that covered the life of Charles Young aired Saturday, 11 February. It's seven minutes long and a fascinating. I spent a great deal of time with the producer, Frank Simkonis, in Wilberforce and at Arlington shooting footage for the show. They made him cut the segment down to bare bones, but he got a commitment to do a longer show later in the year. I spoke about Charles Young and Baltimore native Richard Newton at the monthly meeting of the Maryland Military Historical Society at the beautiful Fifth Regiment Armory in downtown Baltimore, Maryland on November 20, 2016. I spoke at the Smithsonian National Museum of African American History and Culture as a panel member at its very first military history symposium titled: "Double Victory: The African American Military Experience." The panel was titled: "Remembering World War I" and I talked about the legacy of Colonel Charles Young and his impact on a generation of African American officers. The panel took place November 11, 2016, from 2 to 5 PM, at the Oprah Winfrey Theater, National Museum of African American History and Culture in Washington, DC. I was the guest speaker at the celebration of the 20th anniversary of the Baltimore Chapter of the Ninth and Tenth (Horse) Cavalry Association on September 24, 2016. I had the honor of sitting next to 97-year old Trooper William Decatur, one of the few surviving members of the 10th Cavalry Regiment of the Buffalo Soldiers. After he was drafted into army in 1941, his first assignment was Troop F, 10th Cavalry at Fort Myer, Virginia, where he was responsible for training and caring for the horses used in funerals and ceremonies. Bob Stanton, former Director of he National Park Service, welcoming guests. On September 15, 2016, I was invited to attended the National Signing Ceremony of a Memorandum of Understanding between the National Park Service and the Omega Psi Phi Fraternity on support to the Charles Young Buffalo Soldiers National Monument and the Carter G. Woodson Home National Historic Site. Great news on a wonderful new partnership! In early August 2016, I spent two days with Frank Simkonis of Kentucky Educational TV in Wilberforce, Ohio, where he gathered information, took footage, and conducted interviews for an segment on Charles Young that will appear in February 2017 on the program "Kentucky Life." Charles Young was born in Mays Lick, Kentucky on March 12, 1864. At the age of six months, he escaped with his enslaved mother and father north to freedom in Ohio. On July 22, 2016 I assisted Frank Simkonis of Kentucky Educational TV who was taking camera footage of Arlington National Cemetery for a segment of "Kentucky Life" on Charles Young that will appear in February 2017. Frank shot images of Charles Young's grave and the Arlington Amphitheater, where a ceremony was held on June 1, 1923 before his interment. I have had the pleasure of mentoring several students and actors who have reenacted the characters of Charles and Ada Young. Last year a student named Timothy Brown, an MFA acting candidate at SMU, worked with me on his project dealing with the life of Charles Young. I advised and provided him with letters, speeches, and photos of Young to guide his project. Tara Hostnik, the Sequoia Field Institute Manager, asked me last year to help Kayla Edwards in developing a living history character portraying Ada Young, the wife of Charles Young. And finally this year I have mentored an actor named Brandon Richards at Sequoia National park portraying the character of Charles Young. This is fascinating work and helps inform a new generation about the life and accomplishments of Charles and Ada Young. I had a real fun time talking to the Hollin Meadows Elementary Third Grade in Alexandria, Virginia on February 19, 2016 about Charles Young, the Buffalo Soldiers, and writing non-fiction. They were more attentive and asked better questions than I get from many adult audiences! I participated in a panel discussion and talked about Charles Young and the Buffalo Soldiers at the Association for the Study of African American Life and History annual conference September 23-27, 2015 at the Sheraton Atlanta Hotel in Atlanta, Georgia. The panel was titled "Partnering With the National Park Service to Interpret Charles Young and Other Iconic Figures of Ohio the Freedom State." Other panel members include Dr. Joy Kinard, Superintendent of the Charles Young Buffalo Soldiers National Monument; Dr. Charles Wash, Director of the National Afro-American Museum and Cultural Center; Robert Parker, Superintendent of the Harriet Tubman Underground National Monument; and Jewel Haskins, Paul Laurence Dunbar National Historic Site. On June 6, 2015, Floyd Thomas and I visited the Stevenson Cemetery in Greene County, Ohio and found the grave of Laura Smith. Laura Smith was a formerly enslaved woman who with her children were manumitted by their owner after he brought them to Ohio from Mississippi. Laura Smith owned the residence near Wilberforce that was purchased by Charles Young in 1907 and is now the Charles Young Buffalo Soldiers National Monument. Dr. Floyd Thomas is the curator emeritus of the National Afro-American Museum and Cultural Center. On June 5, 2015, after the Friends meeting of the Charles Young Buffalo Soldiers National Monument, I spent some time in the archives with Renotta Young, Floyd Thomas, interns John Vinson and Marcus Pearl, and volunteer Shelley Smith. The National Afro-American Museum and Cultural Center has the most complete and comprehensive Charles Young Collection in the country. Dr. Floyd Thomas is the curator emeritus of the National Afro-American Museum and Cultural Center and Renotta Young is a relative of Charles Young. John Vinson, Marcus Pearl, and Shelley Smith all do research with the Charles Young Collection. I traveled to Wilberforce, Ohio on June 5, 2015 to participate in a workshop at the Charles Young Buffalo Soldiers National Monument held by Superintendent Dr. Joy Kindard to plan for the future operations of one of the countries newest additions to the National Park System. The Charles Young Buffalo Soldiers National Monument works closely with the National Afro-American Museum and Cultural Center which has offices and an archive in the historic Wilberforce Carnegie Library built in 1907. My wife and I visited Sequoia National Park the first week in May 2015. I had been to Sequoia for short visits in 2003 for the re-dedication of the Booker T. Washington Tree and in 2004 for the dedication ceremony for the Colonel Young Tree. It was fun to spend five days hiking in the Giant Forest and good to visit the Colonel Young Tree again. I also had the opportunity to talk to twenty park rangers at the Sequoia National Park Headquarters at the Foothills Conference Center on Friday May 8, 2015. During the lunch-time brown bag series, I discussed Charles Young, the Buffalo Soldiers, and their eventful summer at Sequoia in 1903. I took part in a panel on Saturday April 25, 2015 as part of the Earth Day Texas 2015 celebration in Dallas. The National Park System is kicking off its Centennial Year in 2016, and Suzanne Dixon (NPCA Texas Regional Director), Alan Spears (NPCA Historian), and I discussed the heritage of the National Parks, the incredible resources they provide in Texas, and the park system’s bright future. I talked about Charles Young, the Buffalo Soldiers, and their connection to the National Parks. New Superintendent Dr. Joy Kinard invited me to speak at the celebration of Charles Young's 151st birthday at Wilberforce, Ohio on March 12, 2015, sponsored by the Charles Young Buffalo Soldiers National Monument and the National Afro American Museum and Cultural Center. 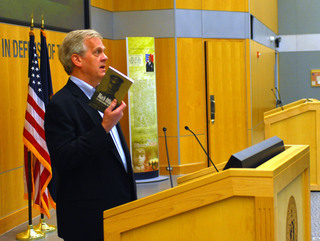 I spoke to a Black History Month audience at the Defense Intelligence Agency on February 24, 2015 about the the research I am doing on my third book concerning the service of seventeen African American officers in Liberia from 1910 to 1930. Three of those men, Charles Young, Benjamin O. Davis, and John E. Green served as military attachés and the other fourteen reorganized, trained, and led the Liberian Frontier Force. 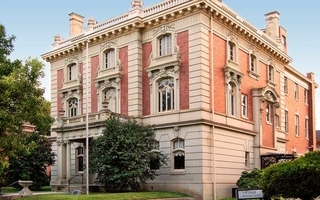 The Presidio Trust invited me to present the annual Redmond Kernan History Lecture on November 20, 2014 to an overflow crowd at the historic Presidio Officers Club in San Francisco, California. Title of the presentation was "Captain Charles Young and the Ninth Cavalry at the Presidio: Buffalo Soldiers at the City by the Bay, 1902-1904." Signing books and talking to participants at the November 20, 2014 lecture discussing the life and times of Captain Charles Young and the Ninth Cavalry during their permanent stationing at the Presidio of San Francisco from 1902-1904. 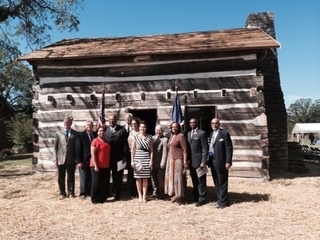 Speakers and dignitaries in front of the Charles Young birth cabin on September 28, 2014. I stand at the far left with committee members responsible for restoring the cabin, Kentucky officials, and other dignitaries who spoke at the ceremony. The cabin dates from 1792 and served as slave quarters when Charles Young was born there on March 12, 1864. The committee bought the property, restored the cabin, and is currently doing a feasibility study to see how best to preserve this historic residence for future generations. 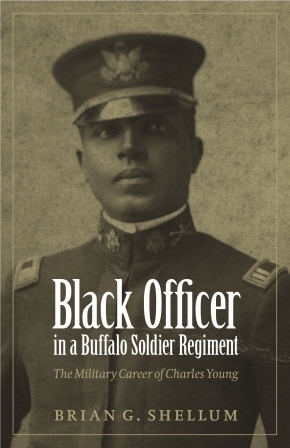 I spoke and did a book signing at the May 10, 2014 dedication of the historic marker at the Charles Young Buffalo Soldier National Monument in Wilberforce, Ohio. This event coincided with the 130th anniversary of Young's acceptance of his nomination to West Point in 1884. I was the keynote speaker at the Charles Young 150th Birthday Celebration at the National Afro-American Museum and Cultural Center sponsored by the National Park Service and the staff of the Charles Young Buffalo Soldier National Monument in Wilberforce, Ohio on March 12, 2014. The new Acting Superintendent, Robert Parker, did a superb job organizing the event. I took part in a Foundation Workshop to plan the future of the Charles Young Buffalo Soldier National Monument from July 8 to July 11, 2013. The meetings involved both the public and stakeholders and National Park Service members from across the country attended. For any details on planning for the park, contact Dr. Reggie Tiller, Superintendent (513.684.3262/Office; reggie_tiller@nps.gov/e-mail). There was a wonderful wreath-laying ceremony at Arlington Cemetery honoring the 90th anniversary of the interment of Colonel Charles Young on June 5, 2013. The ceremony was sponsored by the National Coalition of Black Veteran Organizations and the Omega Psi Phi Fraternity. Click on this link to read an article I wrote titled "Charles Young and the Buffalo Soldiers After the Indian Wars" that appeared in the Spring 2014 Nebraska History magazine.